Mounts to sling swivel stud or picatinny rail Lightweight and compact with quick deployment Great for bench or prone shooting Spring–assisted design Included sling stud adapter can be used without bipod for additional sling mounting options Padded rubberized feet Lever lock for quick tension adjustments or complete locking Durable construction for the harshest environments ..
Like every Trigger Stick, the new Primos Trigger Stick Gen 3 adjusts to your desired height with just one hand and the pull of a trigger. The new Quick Detach Yoke System with Integrated Lock makes it easier than ever to switch from gun to optics and back again. Smoother panning action helps you rotate, scan and find your perfect shot effortlessly. 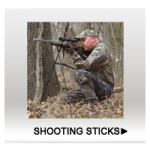 It’s the next level of Trigger Stick to give you the next level of confidence in every shot in all terrain – standing, sitting, or kneeling! 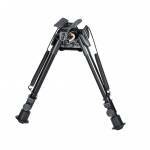 Ne..
Held open with spring tension and securely locked by robust claws, this drop-in bipod clamps directly to a picatinny rail to provided supported fire in any condition. 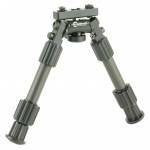 Material: Aluminum Dimensions: 6.5-9" H Attachment Type: Rail Mount Description: Bipod No. 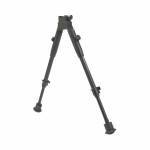 of Legs: 2 Type of Feet: Multi-Surface Vertical Adjustment: 6.5-9" Weight: 9.2 oz ..
Allen Compact Shooting Stick - 14.5 in - 34 in. 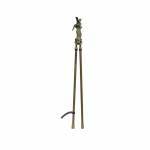 The Allen Shooting Stick is a must have for turkey hunting or to get a good balanced shot. * Aluminum Sectional Staff with Cam Locks * Padded Foam Grip * Matte Black Finish * Compact 14.5" - 34" .. 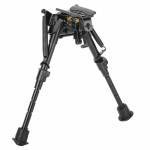 The Caldwell Accumax Premium Bipod was designed with the shooter in mind, this tactical rifle bipod features quick-deployment carbon fiber legs and sturdy feet for enhanced stability. Dial-in with ease using the twist-lock technology, 180 degrees of leg angle adjustment and the swivel tension lever. It features a M-LOK and KeyMod adapter for easy and secure lock-up, lightweight, quick-deployment carbon fiber legs with vertical twist-lock technology with leg angle adjustment up to 180 degrees wit..
Bipod has a quick attach system for mounting to a picatinny rail. Built-in systems for pivot and cant. movements for maximum range of alignment without having to reposition. Internal spring system is low profile and quiet. Fast and secure, no wobble height adjustment. Rubber feet. Anodized Aluminum Construction Quickly attaches/detaches to any Picatinny rail 20 degree pan and 18 degree cant movement Matte Black ..
Caldwell's XLA Bipods provide a stable shooting support that conveniently attaches to almost any firearm with a sling swivel stud. The lightweight aluminum design adds minimal weight and deploys quickly, with legs that instantly spring out to the shooting position with the touch of a button. Its legs are notched for easy indexing to a specific height. There is a connection point for sling attachment and multi-section legs that collapses forward allowing for convenient carry of the firearm. Soft .. 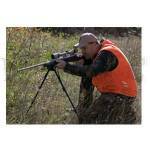 Provides a stable shooting platform that easily mounts to a Picatinny rail. 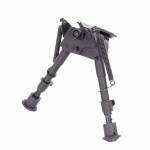 • Light weight aluminum design • Quick deployment with spring loaded legs • Adjustable leg height for the perfect positioning • Soft rubber feet for enhanced stability • Cam over lever secures bipod to pic rail firmly • Collapsible for transport, leave on your gun .. The Caldwell XLA Bipods provide a stable shooting support that conveniently attaches to almost any firearm with a sling swivel stud. The lightweight aluminum design adds minimal weight and deploys quickly with legs that instantly spring out to the shooting position with the touch of a button. The legs are notched for easy indexing to a specific height. There is a connection point for sling attachment and multi section legs that collapses forward allowing for convenient carry of the firearm. 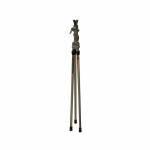 Soft..
Champion BiPod Shooting Stick - 6-9 in. Champion Adjustable Bi-Pods provide Rock Steady assurance for precise shot placement.. 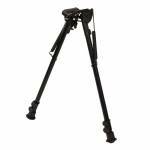 Compact and lightweight Spring-return telescoping legs Easily attach to sling swivel stud Quickly adjust to heights between 6"-9" Steady shooting Fold out of the way when out of use ..
Champion BiPod Shooting Stick - 9-13 in. Champion (Formerly Shooter's Ridge) Adjustable Bi-Pods provide Rock Steady assurance for precise shot placement. 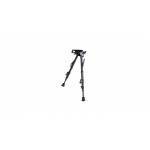 Compact and lightweight Spring-return telescoping legs Easily attach to sling swivel stud Quickly adjust to heights between 9"-13" Steady shooting from both sitting and kneeling positions Fold out of the way when out of use .. The MSR Tactical Bipod is designed specifically for the modern sporting rifle and is constructed with a lightweight polymer. Attaches easily to a Picatinny rail and provides a steady aim for rock solid performance. Rapid Height Adjustment Pivot Action for Uneven Terrain Textured Feed for Secure Grip on all Surfaces. .. This Bi-Pod is compact and lightweight no assembly required and extends quickly and easily attaches to sling swivel and stud. 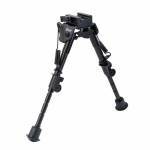 Steady Pod has a durable triangular leg design that extend quickly, easily and quietly. * Adjustable from 13.5" - 23" ..
Where the game goes, so does your reticle. 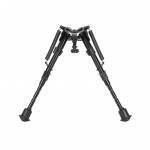 Shooters Ridge Pivot Bi-Pods smoothly rotate to keep you on target and in the action. These pivoting bi-pods are designed specifically for hunters who need a steady, portable and versatile rest out in the field. Available in three length options, you're sure to find the right fit for your hunting situation. 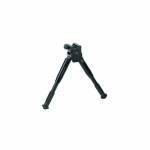 From sitting or kneeling to prone position, there's a Pivot Bi-Pod for you.When you need to make the shot, don't depend on a branch. Get on Target..
With just one hand and the pull of a trigger, you can adjust the Primos Trigger Stick to your desired height. 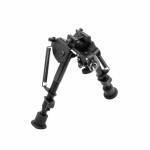 The Trigger Stick is a lightweight height-adjustable gun rest and optical gear mount, perfect for kneeling or standing. It comes equipped with a detachable V yoke. The Trigger Stick fits 1/4-20 & 3/8-16 threaded fixtures for securing optical gear. It is perfect for cameras, spotting scopes, binoculars, laser range finders and almost any other mono pod mountable device. 360 degree r.. Mounts to sling swivel stud or picatinny rail Lightweight and compact with quick deployment Great for bench or prone shooting Spring–assisted design Included sling stud adapter can be used without bipod for additional sling mounting options Models TG8901L and TG8902L feature long legs to accommodate standard-capacity detachable magazines Padded rubberized feet Pivoting base for precision leveling on uneven surfaces Lever lock for quick tension adjustments or complete locking ..
6 – 9″ Foldable & Height Adjustable Bipod Heavy duty – made of hardened steel and aluminum Non-rust black anodized finish Compact and light weight. High-tech durable aluminum construction and steel top platform Easy sling attachment. (A Rail Adapter is required for mounting on a Picatinny / weaver rail.) Foldable arms with robust external spring tension control Fully adjustable legs with lock and quick retraction button Extendable Legs: Length of both legs can be adjusted fo..
Switcheroo Shooting System – Easily switch between accessories in the field using the same shooting tripod Three-section, high-strength, lightweight aluminum legs with camo finish Universal Shooting Rest swivels 360° and rubber covered to prevent damage to gun stocks Rapid-adjust lever locks with adjustable tension Legs adjust independently out to 40° angle with adjustable tension Inch markers on middle leg sections help to quickly reach a set height All-terrain foot system with r..
Strong and lightweight at 11oz., gain stability with minimal weight. Attach to any Picatinny rail with a single screw. Legs lock in vertical or horizontal position. 9-13" Adjustment .. Proven time-tested design for bench or field shooting. 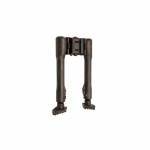 Compact and lightweight deisgn Anodized legs with increased spring tension will not rust Telescoping legs with spring return Attaches to sling swivel Adjustable 6-9" ..